I gave up: Meats, glorious, meats–chicken, turkey, and fish included. The biggest challenge: Where do I begin? Ignoring the enticing smells of my roommates’ cooking? (You made red curry chicken from scratch?? This week? Really?) Fighting the urge to pick up a tasty wrap after working late? (After all, who would know?) But, somehow, I dug deep and made it through. Why? Because I would know if I cheated, and I’m a perfectionist to the core. My takeaway: While I’ve successfully given up the other meats over the years (pork, bacon, pepperoni, beef), it’s going to be tough to go that last mile and kick the poultry. If I ever do decide to quit meat, I may need to wean myself off rather than go cold (no) turkey. I’m celebrating with: The first chicken burrito I can get my hands on. And man, will it taste great. 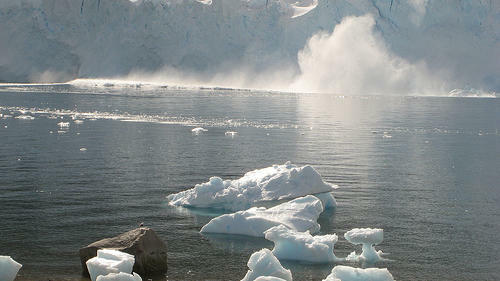 You’ve seen the photos, of glaciers shearing off into the sea. This week, I was one of those glaciers, as I watched huge chunks of my willpower fall away, dropping into the sea below. On Monday, my desire emerged in writing, as I encouraged my boss to “have a good meating.” On Wednesday, I swore that I heard one of my roommates say, “yeah, that cookie would be even better with turkey butter on it.” (He had said “cookie butter.”) This morning, in line at Starbucks, I misread a placard to read “cheese bacon.” (It said “cheese danish.” I was close!) Has giving up meat really impaired my ability to read, write, and hear? Evidently, my subconscious has spoken, and it’s spoken clearly. It’s time for some f***ing chicken.